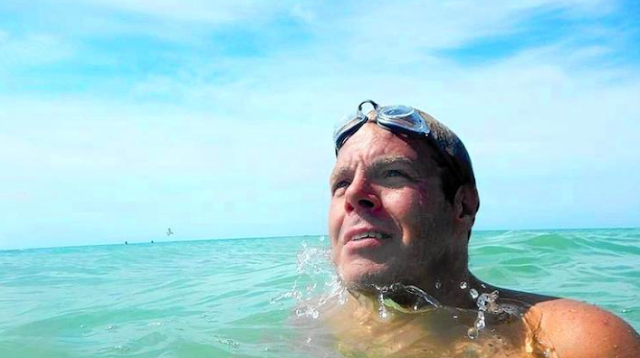 Scott Weston Wolford, a 53-year-old masters and open water swimmer passed in a tragic fire on April 1st. Herman Arrivillaga explains the current ongoing fundraiser Water Conservation Fund in his memory, "The beloved man was a patriot for clean waterways going as far as writing a children's book on the topic (Gino the Minnow). Let's continue his efforts by funding a non-profit that will further his efforts. I'm raising money for Indiana Water Pollution Control Association. Your contribution will make an impact, whether you donate $5 or $500. Every little bit helps." In addition to Gino the Minnow, Wolford also attempted a 120-mile (193 km) non-stop solo swim in Lake Michigan in 2016. "I've always had aspirations to be in the Olympics, but no matter how hard I tried, I wasn't fast enough. So I wanted to be first in something. [Also] I really want to bring awareness to the importance of clean water. A lot of people, especially locally, take fresh water for granted." He explained why proceeds from his fundraising campaign were given to The Nature Conservancy, a land and water conservation charity. "I grew up in the Indiana Dunes National Park and have always felt a strong connection to nature and water. This swim has been a lifelong dream of mine. I want to bring awareness of the importance of clean water worldwide. This record may not last forever, but I will always be the first to complete a double crossing of Lake Michigan.."
In preparation for his planned 60-70 hour attempt, he trained a 10-hour and a 20-hour swim. But he admitted the mind training was even more important. "The main thing is mental work, especially when you have three days of not sleeping. Some swimmers sing songs in the head to break the monotony or they tell stories. I've always had an active mind so I rarely get bored. I can keep myself mentally amused." Unfortunately, weather and deteriorating conditions faced by his crew and trainer Annabel Lavers led to the swim being aborted after 18.5 miles in 15 hours. His dream remained with him, but Arrivillaga is celebrating his legacy with a Water Conservation Fund. To support the Fund, visit here.